When they first appeared on newsstands in the early 1940s, Classics Illustrated stood alone among comic books. At the time, everything else published in the new “four color magazines” was horror, crime, superheroes, and funny animals. The series was the dream of Albert Kanter who, in 1941, saw how incredibly fast comic books were growing. He wanted to add something of substance to this new publishing sensation. It was his idea that the rapidly expanding readership in the field of comic books could be used to introduce younger readers to the great works of literature. The heart behind Kanter’s original aim worked despite memorable flaws such as changed endings, covers could be as violent as anything else on newsstands, and art that could be occasionally found lacking. But the original books were of their time and as the years went by; these flaws were often fixed as issues went to press again and again. Reading Classics Illustrated helped my father find Jack London and classical myths and also introduced me to Sherlock Holmes. Today, the original idea behind Kanter’s very successful publishing breakthrough is being kept wonderfully alive by Papercutz Publishing. Their two concurrent series of Classics Illustrated are once again inspiring both young and the old to find their way to the classics. In addition to pointing the way back to the written word, the high quality of the new Classics Illustrated books being published today are creating works of art that today stand miles above what Kanter was able to do in his day. 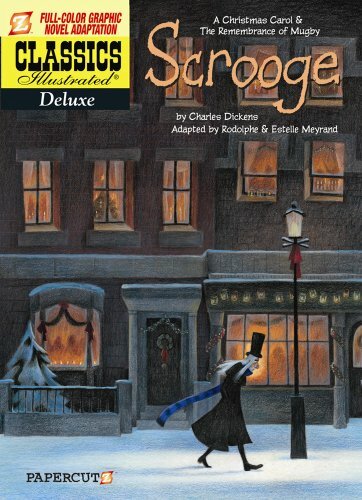 The newest volume in Papercutz series of Deluxe Classics Illustrated features two Charles Dickens holiday tales. In addition to the retelling of A Christmas Carol, the book also brings light to one of Dickens’ best short stories. “A Remembrance of Mugby” is a wonderful find for all readers. Through countless adaptations in film, print, animation, and other forms of media, A Christmas Carol is so well known to so many of us that much of the story can be almost recited from memory. By this time in the 21st century the story has been almost reduced to cultural shorthand. Even the name Scrooge has entered the common language as an adjective. But there is darkness at the center of what Dickens originally wrote. When Scrooge looks back at his youth it is a moment that can even make a ten year old nostalgic and sentimental for what might have been. The visits to the graves of Scrooge and Tiny Tim are filled with real horror. Some feel that the tale, while a celebration of the then newly emerging Christmas holiday, is also an indictment of the emerging industrial age as well. Others fell it is a 100% percent condemnation of greed itself. As adapted by Rodolphe and illustrated by Estelle Meyrand, this new version does not ignore those undercurrents of darkness. The division between happiness and Scrooge’s own journey is very subtly underscored. When the story focuses on Scrooge’s journey, the colors are filled with gray, dark blue and are filled with hints of dirty snow. These moments scream of sadness. loss and reflection. When the story moves to a town filled with celebrants, or the Cratchit family toasting their own joy, Meyrand’s panels ring with browns and reds and yellows are master classes in how to use light in a graphic novel. Without realizing it the reader develops a real sense that so much of the story they are reading is actually lit by fire and lamps. At its best, the art positively sings with the hope, togetherness, and dreams found in anticipation of the holiday. As beautiful as Meyrand’s art is, there is one minor drawback to this adaptation. Rodolphe’s choice as a writer to combine the ghosts into a single visit from Marley can leave a familiar reader feeling an occasional sense of loss—particularly for three original ghosts who visit Scrooge over the single night. So familiar is the story to so many of us that these changes are really just minor distractions in this wonderful adaptation. The second story, “A Remembrance of Mugby,” is essentially new to almost everyone who will pick up this new graphic novel, neither the artist nor writer are bound by the reader’s expectations. The tale centers on a man who has built a life around his company and riches. It is only when his wife and best friend run off that he finds his life is devoid of any meaning. As he travels through England looking for something to hold onto, he meets a cast of characters that seem to emerge effortless from the smoke and dirt of countless train stations. Here Meyrand excels as she first gives us a the blue world of trains stations and then opens up to a world filled with color and light as Mugby stands to be revealed as exactly what our hero has been looking for all along. Here Rodolphe shines as he avoids the clichés of Dickens’ original tale by giving us their true essence. In many ways “Mugby” is A Christmas Carol stripped of ghosts and graveyards. The confusion inherently found in the train stations found in the town of Mugby mirrors the search of a man who has seen what he thought was valuable to him disappear. As the story moves closer to conclusion Meyrand fills each page with the light of discovery. While we may know how the story will end, her touch with a pencil and brush brings a rush of discovery to the inevitable, making our find of such a hidden classic an even greater holiday joy. As publisher of the modern Classics Illustrated, Papercutz has given readers the perfect gift for the upcoming holiday season.